Fettuccine noodles are made with egg. You can do much more with fettuccine noodles than just cover them with Alfredo sauce. 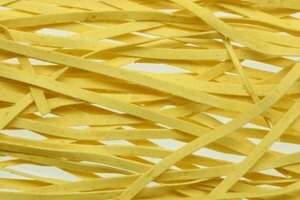 Fettuccine noodles, Italian for little ribbons, are thin and flat egg noodles. They take slightly longer to cook than smaller noodles, such as spaghetti, but they’re as versatile as any pasta. From casseroles to desserts, fettuccine noodles add a mellow background flavor to many recipes. While using a creamy Alfredo sauce is the most traditional way to top cooked fettuccine noodles, it’s far from the only way. Cover the noodles with any Italian sauce, from marinara to pesto, to give them a kick of flavor. Mix fettuccine with any cream soup, such as mushroom or cheddar, to create a quick side dish. Toss the noodles with teriyaki sauce and serve them under chicken and broccoli stir fry for a sweet twist. Lightly sauteing cooked fettuccine noodles in a skillet with other ingredients, especially some sort of sauce, infuses them with flavor. It also forms a slightly golden and crunchy exterior on each noodle. Saute fettuccine with salsa, smoked sausage and bell peppers to give the noodles a spicy kick. Lightly fry fettuccine with shrimp and garlic butter for an elegantly flavored dish. Cook the noodles, ground beef, onions, tomato sauce and pepper jack cheese together to make a Southwestern-style meal. Fettuccine noodles and casseroles may not seem like a natural match at first, but the ribbon noodles work as well as any egg noodle in the mishmash dish. The key is to cook the noodles to al dente, or semi-soft, and then cook them in the casserole. This way the noodles don’t turn to mush. Toss fettuccine, chicken, crumbled bacon, artichoke hearts, tomatoes and Parmesan cheese together in a casserole dish and cook to create a hearty meal with a sophisticated flavor. 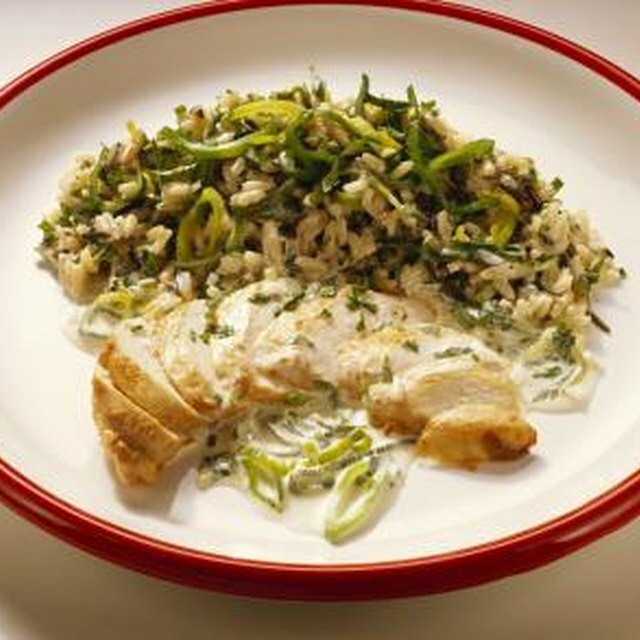 Mix the noodles with water chestnuts, broccoli florets, cauliflower florets and cream of celery soup for a vegetarian dish with crunch. Combine fettuccine, canned tuna, celery, cheddar cheese and sour cream to make a creamy dinner. Noodle kugel is a traditional Jewish dessert that doesn’t typically use fettuccine noodles, but is still delicious if you do. Kugel is like a casserole -- you cook the noodles first, then mix them with other ingredients, place the mixture into a baking dish and bake it until golden. Combine fettuccine with beaten eggs, butter, cream, raisins, chopped walnuts, sugar and cinnamon for a classic dessert taste. Toss the noodles with beaten eggs, butter, cream, dried apples, dried apricots, brown sugar, cinnamon and nutmeg to make a fall-inspired sweet. Mix fettuccine with beaten eggs, butter, cream, dried pineapple, dried mango, shredded coconut and brown sugar for a tropical treat.